greenouse to mount at the exterior wall of a house, garden wall,garage or tool shed. The greenhouse consisting of anodised aluminium profiles andheat-insulating twin wall sheets can be set up at any wall. Thefoldable, practical roof window provides the right air circulation. The rain gutter leads the rain downward laterally at the greenhouse.So you can directly retain and use the rain water with appropriatecontainers. 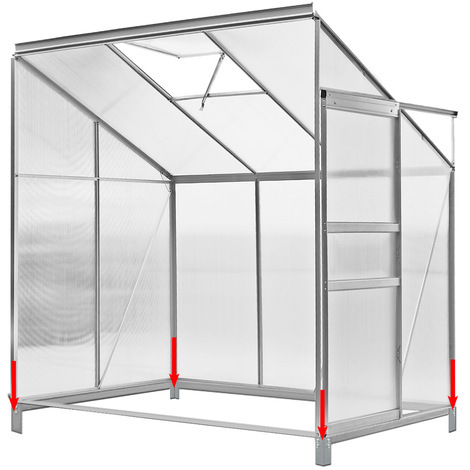 The base made of galvanised steel provides additional stability foryou greenhouse. The greenhouse stands stably and at a right anglethanks to the base. It prevends asinking on a soft underground and offers the best possibility ofa ground fixation. Assembly: The frame will be fixed on the ground with metalhooks. The greenhouse and the frame will firmly be connected to eachother with angles and screws.